For more information and to register to attend, please visit the event website at greenbuildexpo.com. 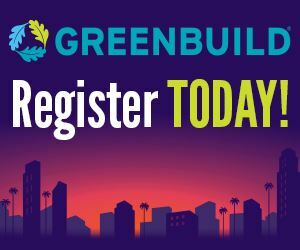 The 15th Annual Greenbuild International Conference & Expo will convene October 5-7, 2016, in Los Angeles, bringing together more than 20,000 passionate green building advocates – architects, designers, building owners, policy makers,planners, young professionals and change makers. The event will feature curated education sessions, inspirational speakers, networking opportunities, more than 600 exhibitors and an epic celebration. Also, the keynote speaker was recently revealed to be none other than best-selling author and journalist Sebastian Junger, best known for his book The Perfect Storm.